SANGER, California – At a table strewn with papers, four eighth-grade boys with gelled hair and flashy sneakers comb through lyrics, discussing everything from girls to grammar. Only one remains silent, nodding lazily. When they reach the line, “You were my pills, you were my thrills,” the unofficial leader shouts: “That’s a metaphor!” He asks the silent one what he thinks. 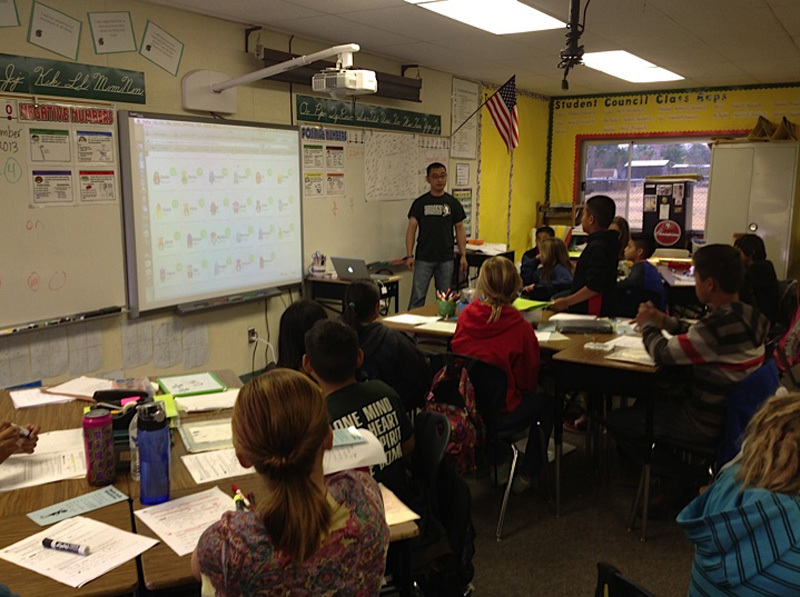 Suddenly, the quiet boy comes to life, offering his opinion in Lisa Johnson’s English Language Arts class at Sanger Unified School District’s Fairmont School, where clusters of four to six students meet often to talk about test scores and work through lessons. This is collaboration in action: Teachers place students by ability and temperament, balancing outspoken kids with shy types and stronger students with strugglers. Teachers work the same way with each other, sharing ideas and teaching classes as a team. But morale used to be so low in Sanger Unified that a sign reading “Welcome to the home of 400 unhappy teachers” lined a highway in this central California region dotted with rolling ranches and dusty farms. The sign went up in 1999. In 2004, the state ruled that the rural area was one of its worst performing districts. By 2012, though, things had changed for the better: Sanger Unified ranked third in achievement gains among California districts with high populations of minority, English language learners and disadvantaged students. The tightly knit community had used its isolation to its advantage, giving both teachers and students time to meet in small groups and collaborate. The federal government singled out Fairmont and three other of the district’s schools for their notable performance improvements. “We don’t believe that you evaluate teachers into better performance.” Matthew Navo, superintendent of Sanger Unified. Despite gaining ground, the 11,000-student district soon faces what may be its biggest hurdle yet. Sanger Unified is about to attempt one of the nation’s most controversial education reforms, one that could threaten the cooperative culture upon which the district prides itself Starting this year, it will tie teacher evaluations to student test scores. Sanger Unified officials call the shift a reluctant one. Why do something the district doesn’t believe in? Sanger Unified is a prime example of a district that finds itself in a bind as it faces new federal requirements under the No Child Left Behind law, which was supposed to raise the number of American students who perform on grade level to 100 percent this coming year. In 2012, the district fell short of the expectations under the law, which holds schools to annual state-specific targets for test scores and graduation rates. Under No Child Left Behind, Sanger would risk a complete restructuring of its culture and staff, threatening small-group cooperative work and other innovative district programs among both students and staff. For this reason, the district has chosen the lesser of two evils: a federal waiver under the No Child Left Behind Act that allows the setting of different proficiency targets in exchange for promising to several overhaul measures. Districts would also get more flexibility in how to spend federal Title I money for low-income students. Eighty-two percent of Sanger Unified of students were minorities, 76 percent were eligible for free- or reduced-price lunch, and 24 percent were English language learners at the end of 2011. California did not apply for a waiver from No Child Left Behind this year, but Sanger and seven other California school districts banded together and accepted one. The eight districts promised to link teacher evaluations to student performance starting with pilot programs in 2014-15, and a full launch the following school year. The districts are still determining how to weigh different measurements of student performance, such as test scores. But any formula the districts adopt will most likely use standardized tests to determine which teachers are good at their jobs, and which teachers should be replaced. The new federal rules, while less intrusive, according to Sanger Unified officials, still focus on individual achievement, not the collaboration that the district has made its trademark The district is also shifting to meet Common Core State Standards, which take full effect in 2014-2015 and emphasize critical thinking and writing. Classrooms already have an analytical atmosphere but the prospect of two transitions at once is daunting. Although he says he is relieved to be ditching No Child Left Behind, Sanger Superintendent Matthew Navo also says he is concerned about the shift. Teachers within a school district, or within a school, could be evaluated differently because new state standards only apply to certain subjects. Right now, Sanger’s teachers move between classrooms, sharing students and ideas, but evaluations could scare them away from collaboration. “When student performances are indicative of one teacher rather than the whole group, teachers will be less inclined to share,” Navo says. Previously, the Obama administration had only granted state waivers. For Sanger Unified, being part of the eight-district waiver group has some benefits — but is perhaps not optimal. Had Sanger been able to apply for a waiver on its own, the district may have had more say in how to adapt to the administration’s requirements. California districts applied for their waiver under their umbrella organization, the California Office to Reform Education (CORE), which led the application process. Together, the districts created their own set of student performance standards based on academic and nonacademic qualities; grit and tenacity will factor in, along with state exams and other non-state tests. Each district has the flexibility to create its own teacher evaluation system, with some caveats. Student performance on state tests must account for at least 20 percent of teacher evaluation criteria. Alternately, districts can opt for a trigger system, which measures teacher performance against student performance, and leaves some room for districts to focus away from test scores — but sets punitive consequences when student and teacher performance don’t align. Although Sanger Unified is leaning toward the trigger system, it hasn’t at this point developed a plan. If it were to do so, that plan would be subject to review by other CORE districts. 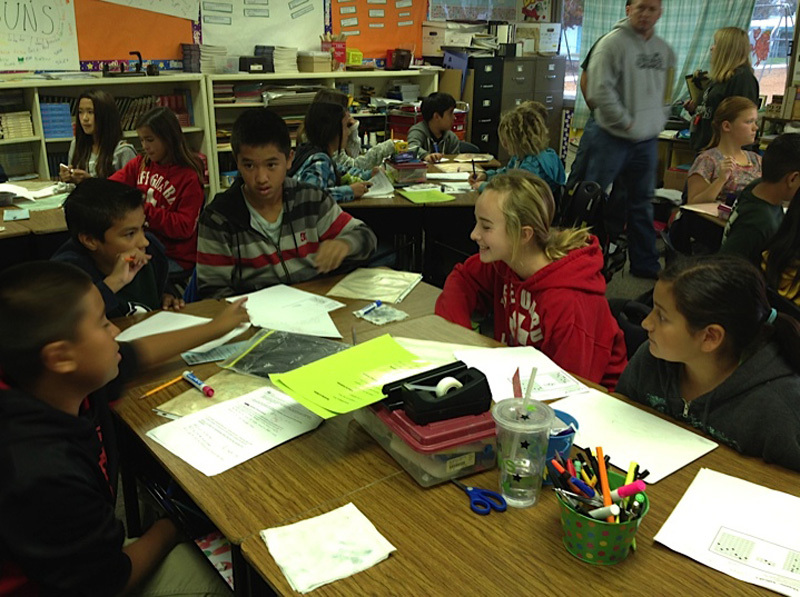 Sanger Unified enrolls fewer students than the other CORE districts. That means it may be easier for the district to measure and evaluate teacher performance based on students’ overall performance instead of focusing on state tests. Some bigger districts, like Los Angeles Unified and Long Beach, have indicated they are more comfortable with the state tests — both districts’ teachers unions have agreed to contracts that would link teacher evaluations to student performance, according to CORE Executive Director Rick Miller. Fresno Unified School District, just 15 miles from Sanger, is the fourth largest school district in California, with 73,000 students. Fresno’s teachers union says it is adamantly against the new evaluations. District Superintendent Michael Hanson says he is not. Despite the friendliness between the CORE districts — Hanson and Navo communicate often — bigger players could outweigh Sanger Unified’s interests as the group hashes things out over the next several months. “Teacher evaluations based on student test scores inevitably pit teachers against each other, and that pulls against working together and sharing,” said Joan Talbert, a Stanford University researcher who has studied how mandates effect collaboration in schools. Talbert and Jane David, director of the Bay Area Research Group, are the co-authors of a 2013 S.H. Cowell Foundation report, Turning Around a High-Poverty District: Learning from Sanger. Talbert and David say they found that while No Child Left Behind reinforced an inclusive culture in Sanger Unified, the proficiency expectations were unrealistic for the district. And Sanger holds everyone accountable for student progress instead of punishing individual teachers when test scores are too low. “It’s not that Sanger doesn’t believe in using evidence – they definitely do,” Talbert said. “But the reason for using it is to see where teachers need support.” Not to penalize them. Fairmont curriculum-support provider Suzanne Juarez says that with all the unknowns, she can only encourage teachers to continue doing what they’ve been doing. “You take the best of what you’ve done, refine that, and then add the new stuff,” Juarez said. But if evaluations upset school culture, teachers could flounder. Tiffany Taylor, an English Language Arts teacher in her first year at Fairmont, was drawn to the collaborative atmosphere. 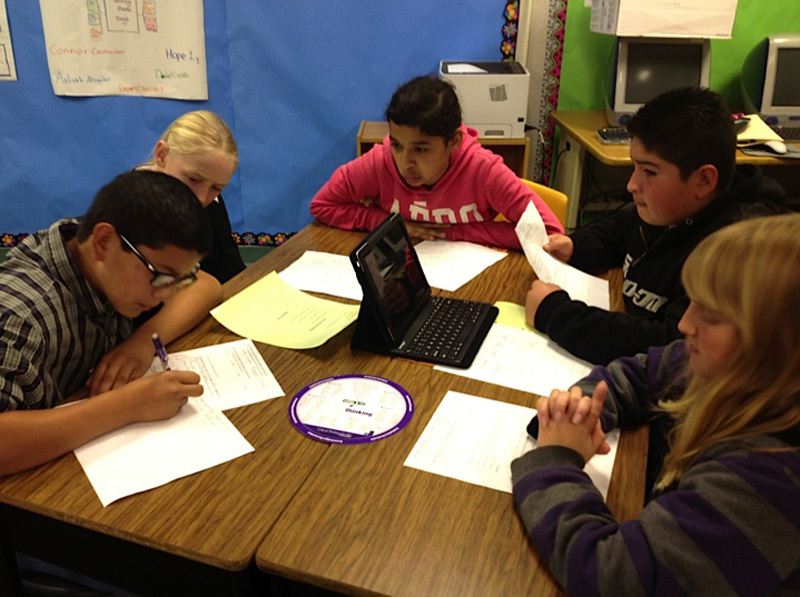 “My students almost can’t stop collaborating. It’s innate in them to communicate this way,” she said. For Taylor, a twenty-something who wears jeans and sneakers to work, other job prospects offered less opportunity for her to team up with other teachers. At Fairmont, she can decide what works in the classroom, even if it means asking a more experienced colleague for help. She often turns to fellow ELA teacher Lisa Johnson for advice, or has Johnson re-teach a lesson she struggled with. Both teachers credit Fairmont principal Jared Savage for cultivating an encouraging, team-like atmosphere among staff. This focus on student progress, a culture several years in the making, is what Sanger stands to lose. Navo says he understands this. He is giving CORE a shot, but said he won’t accept a final plan that hinders his teachers or threatens the culture they thrive in.